I managed to get out of work early today, and make it down to Spartanburg to do the downtown crit. I brought my laptop to stay on top of some school work, and lo and behold - the race is next to the public library. Horray for wi-fi. On to the race - I may be fat, out of shape, and have jacked up knees...but I can still squeeze out a top ten out of 40-50 dudes despite spending way too much of the race out in the wind, not eating well the last couple days, and treating it like a "C" race. As I like to do, I attacked from the gun to try to thin the herd a little bit, but as we were crossing the line I heard the all too familiar noise of bikes and flesh meeting the pavement. After the crash, we spent a fair amount of time waiting around to restart, and then restart again. So, everyone had cold legs, and the guys who'd fallen off the back, or were involved in the crash were back in the field. Horray. I'll be at Dilworth tomorrow, and possibly Walnut Grove on Sunday. So, um, did you win? So how did you get upgrade points? For cat3's, you get upgrade points up to 10 places. How long was this crit? "35" minutes. Ended up being only about 20ish minutes of actual saddle time. 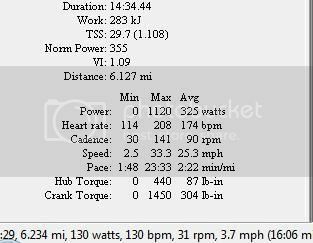 Also, the 208bpm wasn't me. The non-coded HR strap does fruity things sometimes. That crash happened right in front of me. It was narsty looking. Glad that you werent involved. Good job. Just showed up, forgot about all your "disadvantages," and raced. Top 10 is badass. 4-3 upgrade points only go out 6 places. Sorry. Still congrats on the race and you seem to be doing well considering the surgeries! USCF upgrade points from 4 to 3 go as follows: 7-5-4-3-2-1 points for the top 6 places. I thought snuff was already a cat3? edit: which would mean that it would be his CAT-2 O Meter ticking. Note to self: don't post immediately after getting back from a race. Last edited by TheKillerPenguin; 05-05-07 at 11:46 PM. Bikes: R600, Specialized Tarmac Pro, Prophet w/ X0 components. To go from 4 to 3 all you need to do is pull out 25 races...much the same as 4 to 5. You can also upgrade via top 10s - which is what I'm attempting to do. Or you can upgrade via points.